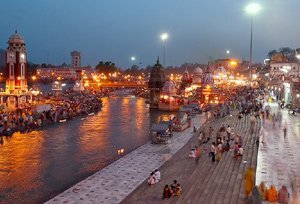 Haridwar, famous for its spiritual relevance, is one of highly visited pilgrimage places in India. Positioned on the banks of Ganges River, it portrays Indian mores and traditions in full effect. Haridwar invites folks of different beliefs and background in the beautiful state of Uttarakhand. There are a great number of holy ashrams which teach the knowledge of science, philosophy and Indian arts. It is pointless to say that the place hosts sacred fairs all throughout the year. A few of the most famous fairs are Kumbh Mela, Ganga Dusshera and Somvati Amavasya Mela. Apart from the holy importance, the city has a pleasant weather that creates a soothing impression on guests' arrivals. The holy city of Haridwar finds its recognition as Kapila, Gangadwar and Mayapuri in ancient Hindu texts of India. Each one brings to light a particular aspect of the city. It is also a gateway to the Chardham that includes the four main pilgrimages sites of Uttarakhand - Gangotri, Kedarnath, Yamunotri and Badrinath. There are oodles of tales of the sources of this heavenly place. Of all, the most celebrated one is about the King Bhagirath, Grandson of Suryavanshi and a follower of Lord Shiva is deemed to have gotten River Ganges down from heaven by carrying out severe penance to render liberation to his ancestors. And it is also believed that the city is blessed by the existence of all three supreme gods - Brahma, Vishnu and Mahesh. 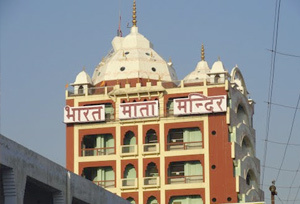 Bharat Mata Mandir: Established by Swami Satyamitranand Giri, Bharat Mata Mandir is among the popular centers of this place, which is flocked by tons of travelers from various parts of the globe. The Breathtaking designs, marvelous structure and various mythologies allure travelers the most on their visit. Chanda Devi Temple: A Hindu temple devoted to Goddess Chanda Devi located on the top of the Neel Parvat in the sacred city of Haridwar. Chanda Devi Temple is a celestial place where desires of every devotee are nurtured by the goddess. One can visit the temple all throughout the year. Mansa Devi Temple: Another holy place is Mansa Devi Temple where devotees tie threads on the blessed tree to get their wishes fulfilled. And once the desires are gratified, the pilgrims come back to untie them. One can also enjoy having a picturesque sight of Haridwar from here. Udan Khatola: One of the main appeals of Haridwar, Udan Khatola is a ropeway used to arrive at the hilltop shrines of this place. One can relish the gentle breeze and picturesque vistas of the entire surroundings during his/her ride. Chilla Wildlife Sanctuary: Stretched over an area of 29 Sq Km, Chilla Wildlife Sanctuary is a main attraction amongst nature lovers and wildlife aficionados. Travelers at this spot get a superb opportunity of scouting the flora and fauna from a close distance. Moreover, the backdrop of the wildlife sanctuary is magnificent and makes every traveler feel invigorated. By Air: Jolly Grant Airport in Dehradun serves as the closest airport to arrive at Haridwar. For further journey, one can hire a taxi or a cab to the holy city. By Rail: Haridwar is well connected to all the main cities of India by railway networks. One can also take the train from Delhi as many trains run from Delhi to Haridwar on regular basis. By Road: Bus services to Haridwar are available from the main cities like Jaipur, Delhi, Shimla, Jodhpur and many others positioned near to it.